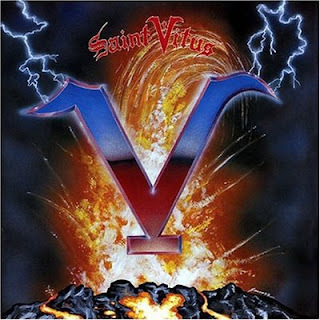 Saint Vitus. A legendary psychedelic doom metal band whose best moments(to me) were in the mid to late 1980's . Their three best albums are "Born Too Late"(1987), "Mournful Cries"(1988), and "V"(1989). Their sound is very Black Sabbath oriented, with a dose of Black Flag and a heavy dose of psychedelia thrown into the mix. The tempos are agonizingly slow yet hypnotic...they reach a nice head banging mid-pace every now and then. The guitar playing is thick, sludgy, and heavy, with guitar solos that conjure up the darkest psychedelic demons from the depths of hell. Scott "Wino" Weinrich's vocals owe some debt to Ozzy, but they also have a rough and reflective edge. 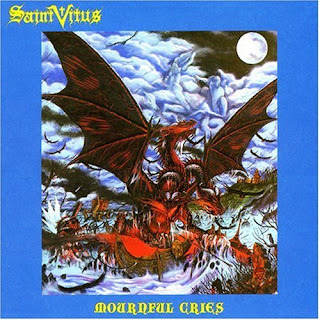 Saint Vitus's influence on stoner metal as well as as doom/goth metal is tremendous. Bands ranging from the psych/space rock of Monster Magnet to the gloomy, acid laden goth rock of Christian Death(with Rozz Williams) to the superbly crafted doom of Electric Wizard owe a heavy debt to their work. 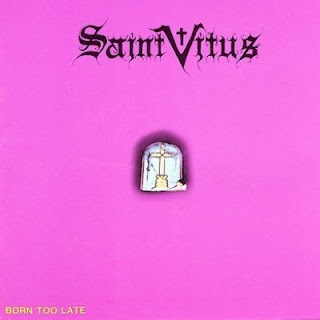 Saint Vitus never achieved commercial success. They stayed true to their sound and roots, and maintained a loyal cult following. Their vocalist Wino left the band and formed The Obsessed and later Spirit Caravan. Saint Vitus continued to make music for many years in different incarnations. Here's the slow, title track from their first album with Wino, "Born Too Late". A hippie metal anthem. The album is a raw, sludge laden masterpiece. Here's "Dragon Time" from "Mournful Cries", hands down the gloomiest album of the three. And here's "Ice Monkey" and "I Bleed Black" from "V", my personal favorite CD of theirs.